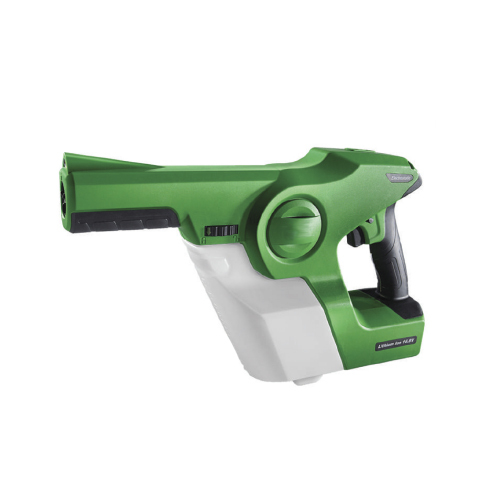 HAND-HELD ELECTROSTATIC SPRAYER | Pro Chem, Inc. This ELECTROSTATIC SPRAYER provides many unique characteristics that cannot be found on other sprayers. It double charges the solution it is spraying. The product is charged when it enters the tank and again when it is sprayed. As the fully-charged droplets hit the surface, they create an even spread. When you spray something that has a negative or neutral charge, the product sprayed will not only cling to what you spray, it will wrap around it, fully encasing it. Particles hold their cationic charge for approximately 2-3 seconds, preventing drips. This allows the solution to cover hidden and shadowed areas. This SPRAYER allows for better coverage in less time. Because of the even spray, 70% less chemical is required to clean an area. It also provides more complete and consistent coverage than traditional sprayers. The special battery used with this sprayer fully charges in under 90 minutes and has a run time of four hours while similar batteries have a four-hour charge time and a run time of two hours. If you purchase a backup battery, you will be able to run the sprayer for a full 8 hours. Coverage per Tank*: 2,800 sq. ft. 2,550 sq. ft. 1,700,100 sq. ft.
**Always use PPE of the product you are working with. *Dwell time is dependent on the environment at the time of application. High humidity will result in longer dwell time and dry conditions will result in shorter dwell times. To start the use of the ELECTROSTATIC SPRAYER first charge your battery by inserting the 16.8 volt battery into the charger and plugging the charger into a wall socket. Next fill the tank (1.0) by first removing it from the unit by rotating the tank-locking collar (1.2) and pulling the tank release ring (1.1). The tank can now be removed. Note: you must hold on to the tank when you pull the tank release ring or the tank will fall to the floor. Fill the tank with the desired liquid. Insert the tank into the sprayer and rotate the tank-locking collar (1.2) until you hear the click of the tank release ring (1.1) snap into place. Insert the charged battery into the battery socket and lock in place. Pull the trigger and spray on your desired surface. To insure maximized electrostatic performance always keep you hand firmly wrapped around the handle in contact with the grounding strap. NOTE: Not for use with petroleum products. WARNING: It is the operator’s responsibility to read and understand the cautions and warnings in this manual before attempting to operate this machine. Read all the instructions before using the appliance. To reduce the risk of injury, close supervision is necessary when an appliance is used near children. Do not contact moving parts. To reduce the risk of electrical shock, do not put electrode in water or other liquid. Do not place or store appliance where it can fall or be pulled into a tub or sink. Use only the charger supplied by the manufacturer to recharge. This machine contains an electrostatic device that may interfere with sensitive medical devices such as pacemakers, defibrillators, or similar devices. DO NOT operate this machine or stand within 10 feet if you use such medical devices. Contact your physician prior to operation if you are unsure if this machine will interfere with your medical device. CAUTION: To avoid electrical shock do not touch or insert any foreign objects into the nozzle. A cordless sprayer with integral batteries or a separate battery pack must be recharged only with the specified charger for the battery. A charger that may be suitable for one type of battery may create a risk of fire when used with another battery. Use battery operated sprayer only with the specifically designated battery pack. Use of any other batteries may create a risk of fire. DO NOT USE THIS CORDLESS SPRAYER TO APPLY FLAMMABLE LIQUIDS. Do not use oil base liquids. Store formulation in its original labeled container. Ensure that formulation is applied only in strict compliance with the formulation label as well as local, state and federal regulations. Do not use oil-base or flammable formulations with this machine.